What do the below two images (of the same moon of Saturn) remind you of? Answer in the comments. 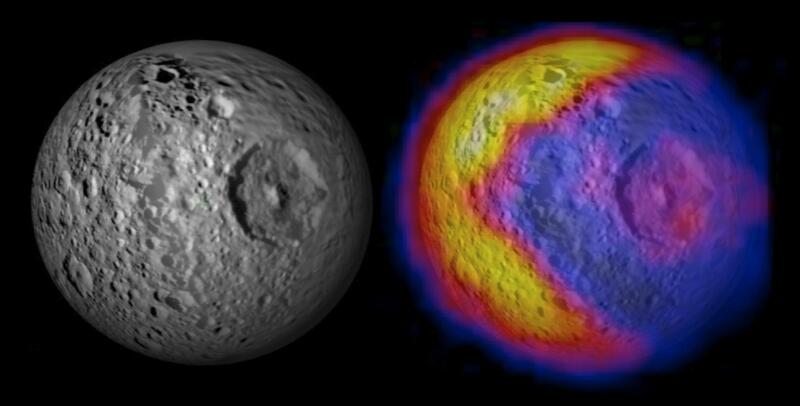 In actually, the picture on the left is an image of a moon of Saturn called “Mimas” under normal lighting, while the image on the right is the same moon using a false overlay of temperature data. “We are writing to reaffirm our commitment to the unbreakable bond that exists between our country and the State of Israel and to express to you our deep concern over recent tension,” the letter read. “A strong Israel is an asset to the national security of the United States and brings stability to the Middle East. That the House felt the need to make this public is an indication of just how disconcerting the deteriorating relationship between Israel and the U.S. has become to the Congress. Support for Israel certainly makes for strange bedfellows, as evangelical Christians (who primarily support Republicans) and secular Jews (who primarily support Democrats) are both groups that strongly support Israel. It will be interesting to see if the administration backs off of its hardline stance on the settlements in East Jeruslaem in the wake of this bipartisan expression of support for the state of Israel. It looks like this year-long health care reform process is finally coming to an end…with a vote on Sunday. I’m still not sure which way it will go…though signs this week indicate it just might sqeek by with the 216 necessary to send the Senate bill to the president. At that point, Obamacare will have passed. All that will remain is the extent to which it will be ‘modified’ in the reconcilliation process. Of course we have the “doctor fix” coming down the line. This change to Medicare cuts for doctor payments adds to the deficit, so the Dems seperated it out earlier since they wanted their bill to have the petina of deficit reduction. There’s a great deal of uncertainty over what will happen Sunday. Based on this week’s indication, I’d rate the chance of passage now as better than 50/50…mabye 55 to 60% chance of passage…though that is little more than a wild guess. If there is a vote on Sunday, it is almost certainly an indicator that Pelosi has recieved assurances from 216 or more members that they would vote yes. If there is no vote on Sunday, then the chances of Obamacare being passed tank…with the odds being that it will be scrapped for the forseeable future. All in all, very interesting times. Be sure to tune in on Sunday…because either way it will have an enormous impact on health care for the next decade and beyond. A little college humor for Spring Break. Recall, we discussed game theory using the strategic or normal form to describe some basic games to use in understanding politics. Cost uses a game tree or the “extensive form” to describe the game theoretic problem that Brown’s victory in MA presents to Democrats wanting to pass health care. In particular the problem for Stupak, a pro-life Democrat who wants language forbiding federal money for abortions in the reconcilliation package sent to the Senate. On the one hand, the Republicans are threatening to object to the Stupak language in a reconcilliation package. This would mean that the health care bill wouldn’t specifically forbid funding for abortion, a deal-breaker for the Democratic Pro-Lifers in the House. But, as Cost notes, this is a “non-credible threat.” In game theory, a non-credible threat is a course of action (Y) that a player (A) could take if the other player (B) chooses X, but where it simply isn’t believable that player A would actually choose Y, since it leads to a lower payoff for player A. Player A “threatens” to choose Y to try and forestall player B’s choice of X. But since it isn’t credible, player B should ignore it. In this case, we can use backwards induction to solve for the subgame perfect equilibrium that reveals the noncredible threat. As Cost notes, if the Republicans are raising a point of order about the Stupak language, then this means the Senate Bill has already passed. So they are left with the choice of having Obamacare with Stupak or without. Since they perfer the Stupak language to nothing, their point of order objection is a non-credible threat. Solving the game yields an equilibrium where the House passes Obamacare, and the Republicans vote for Stupak’s langage. But not so fast! It is Democrats who enjoy the majority in the Senate. And working from reconcilliation, they only need to raise that same point of order to force a 60 vote supermajority necessary to pass the Stupak language. As Cost argues, any guarantee by the Senate Democrats to include Stupak’s abortion language is an “empty promise.” Why? For the *same* reason. The Senate bill will have already passed. What incentive then do the Senate Democrats have to adopt language they have already rejected? – get the House to include his abortion language, vote for the bill, and see that language stripped in the reconilliation process–by the Democrats, not the Republicans–when it is taken up by the Senate post-passage of Obamacare. – vote against Obamacare in the House, thus defeating the Democratic effort at health care reform. Neither choice is particularly palatable to a principled Pro-Life Democrat who wants to remain a Democrat after this vote. But if we believe his “cheap talk” that he would rather have no bill than a bill that permits some form of federal abortion funding, then his sub-game perfect optimal choice would be to vote against the bill. If, however, that “cheap talk” is just a gambit to get his amendment passed…and, in fact, he would prefer Obamacare w/ federal funding of abortions to no bill at all…then we should expect Stupak to cave. Cost raises the only possible solution outside of those two choices: get the Senate Democrats to act first. I think the only solution for Stupak is somehow to find a way for the Senate to act first on abortion. This is the most important point: when Stupak and his bloc cast their votes in the House, their leverage is completely gone. That’s the only power they have in the process. If they are induced to go first, they will lose to the Senate liberals. This may be why the “Slaughter Solution” has begun to get some traction this week. The Slaughter solution (where passage of the reconcilliation bill will be ‘deemed’ by the House to have been a simulataneous passage of the original Senate Obamacare bill) is an effort to avoid the dilemma of sequential moves that Cost describes above. If the Senate bill isn’t ‘passed’ until the Senate approves the House reconcilliation package, then Stupak doesn’t ‘lose’ his leverage. Then again, if it is deemed to have ‘passed’ with the vote on reconcilliation…that seems to be exactly what does happen: the Senate bill passes. Which puts us right back in the same spot (plus a potential constitutional issue). Maybe Slaughter is just about tricking dumb House Democrats into believing that this will get their reconcilliation language adopted by the Senate in toto…despite the fact they have no incentive to do it. Constitutional issues aside, this seems a rather large hurdle for Obamacare: without a procedure that either inverts or eliminates the current sequence, there is no way to pass a reconcilliation bill with Stupak langage that the Senate would retain. Is the Slaughter Solution Unconstitional? Former federal judge and current law professor Michael McConnell says yes. Jonathan Adler agrees. Meanwhile, Adler (no relation) is still a “no” vote against Obamacare. Thomas Sowell thinks we’re being sold a bill of goods. The Wal Street Journal opines that the rules are whatever the Democrats say they are. And looking at it from a district perspective, the swing votes on Obamacare are in Republican-leaning territory. On the other side of the aisle, former Clinton administration official Robert Reich argues that the Dems must vote for reform. And Henry Farrell of Salon argues that all this talk about process (i.e. reconcilliation & Slaughter) is much ado about nothing. Contrast that argument with Emery’s contention that the voters strongly oppose a partisan push for health care reform. …the main emotion among Democrats seems to be a balance of terror: fear of passing the bill against fear of killing it, making them face the wrath of the voters; or their party’s base, leaders, and president. What does all this mean? Darned if I know. But I suspect we’re going to find out very soon what the fate of Obamacare is. If I had to guess, I’d still argue it fails an up or down vote…but then I would have guessed the Dems would have abandoned this course long ago. They seem determined to follow Obama over the health care cliff. Bad news for the millienials. Well, for pretty much all of us. Hattip to Instapundit.